The BLESS 2007 Annual General Meeting took place on January 30th at Sir George Simpson School in St. Albert. 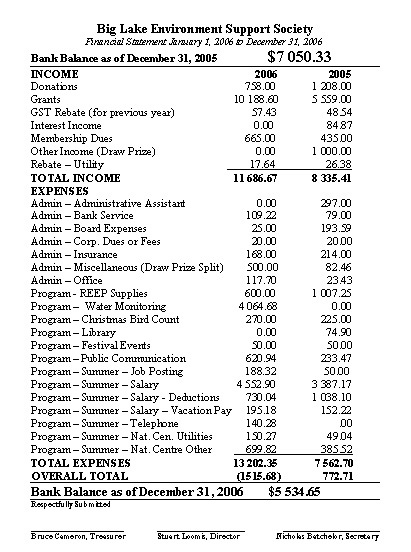 Treasurer Bruce Cameron reported on BLESS finances. There was a presentation by David Burry and Darryl Wall from NAIT on the research project to identify a web camera solution for Lois Hole Centennial Provincial Park. Travis Sjovold from Alberta Parks and Protected Areas provided an overview on the province's initiatives with respect to the park. Dan Stoker gave an engaging presentation on the 2006 Christmas Bird Count. Dave Burkhart gave the President's report on 2006 BLESS activities. Three Special Resolutions to amend the BLESS bylaws were passed. Four directors (Bob Russell, Bruce Cameron, Nicholas Batchelor and John Samson) stepped down from the board and seven (Miles Constable, Lilo Engler, Jack Wiercinski, Stuart Loomis, Louise Horstman, Pat Collins and Dave Burkhart) were elected to the 2007 BLESS Board of Directors.